So this question comes from the assertion in this video (appx 10 mins 50sec) that hardware samplers sound different because they use real time sample rate conversion. While you can change the sample rate for a DAW project or within a soft sampler but it is fixed for that project. I'd be interested to know if that is actually true. Are there any software samplers that can do this? Supplimentary question - if not, would a cheap hardware sampler like a Pocket Operator PO 33 offer realtime sample rate conversion? I think you'll find more people here arguing that it's the A/D and D/A converters (and analogue filters) that make hardware samplers sound different. I'd be inclined to agree with them. 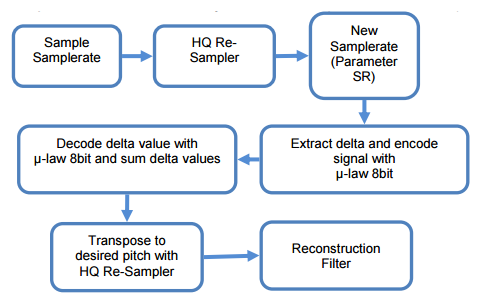 The pitch-shifting algorithms on hardware samplers also factor in to the overall sound. For recording samples, you can change the sample rate of software samplers (though you may only get sample rates and bit depths your audio interface supports), but yes, the sample rate for a project is set within the DAW. And I haven't seen a "sampler" VSTi within a DAW project get around that yet. If you're talking about changing the sample rate during sample playback (either for pitch-shifting or special effects), there are quite a few "sampler"/ROMpler VSTis which can do that. SampleTank and Kontakt are two top-name ROMplers that can vary the sample rate on playback. The Emulator X3 VSTi sampler offers this, too. I guess it comes down to whether you're trying to change the sample rate to record grittier (and arguably, more "interesting") sounding samples, or you want to change the sample rate on playback for pitch-shifting purposes or other effects. But in any case, having the S-50 pitch-shift the one sample he recorded over a couple of octaves will create the sound he gets based upon the algorithm it uses, the distance from the original sample note, the original sample rate, and the D/A converters. Take a one-note sample into Kontakt, stretch it across multiple octaves and you'll get a similar sound--minus the AD and DA converters and analogue filters. All virtual samplers to realtime resampling as soon as you do any repitching operation (changing the tuning or stretching the zone in the mapping) to the sample. One other difference compared to SOME hardware samplers, is that some had a DAC per voice, rather than one DAC for the whole system (in this case - your audio interface). That can and will certainly make a difference. ^ what EvilDragon said, very true! All software samplers resample to the sample rate of the daw project. Some hw samplers did not resample but change pitch by adjusting playback rate. That means no interpolation, thus high quality. would a cheap hardware sampler like a Pocket Operator PO 33 offer realtime sample rate conversion? What kind of effect / sound are you after? hi, thanks everyone for your replies. Sorry I didn't reply earlier. And also apologies for not being clearer about the point of my post and what outcomes I was looking for. Just to confirm, I am looking for that grittier sound by sampling one note and then (mainly) playing a lower note. So in terms of hardware samplers I'm looking more at the same kinds of sounds that came from the CMI IIx, Emulator II - or maybe as grotty as the Mirage rather than pristine. I have Kontakt (which I use mainly to playback sample libraries), Halion 6 (which I use mainly to sample every note from a synth), TAL-sampler, Emulator X3 (a bit wobbly in Cubase, seemingly better in Bitwig) and even Cyclone (although I've not created my own samples within that). I have zero experience of hardware samplers - they came along some time after I started making music and didn't really become affordable until after I didn't have anything to spend! I've looked at the vintage stuff wistfully since but knowing how basic my needs are and willingness to navigate the kind of OS they have, I've left well alone. He already has TAL Sampler. But I don't understand b/c TAL Sampler delivers Fairlight, EMUII etc. sound character. So in terms of hardware samplers I'm looking more at the same kinds of sounds that came from the CMI IIx, Emulator II - or maybe as grotty as the Mirage rather than pristine. Ah, yes. I missed that comment. I agree with you. If he is looking for that gritty old-school character, he's basically already got it. So maybe I don't understand exactly what is wanted either. hi, it is in my posts, honest. I had asked about the "realtime sample rate conversion" used in playback when transposing a sample. It was what was mentioned in the video and was given as one of the reasons hardware samplers sound "better". I was then asked to clarify whether I was looking for best quality or vintage character. It sounds from the replies that not all hardware used this method and some of the software samplers do this so to an extent the video is in error or overstating the influence of this factor. I'm already familiar with the sample rate and bit depth for recording of various bits of hardware. I have some inkling of the different DAC types too. I'm not sure if any software samplers do this. Maybe Morgana? Tal Sampler is great at DAC emulation but I'm not sure if the sample playback is variable samplerate. Have a look at Permut-8, obviously this is just a delay but it uses variable samplerate emulation so you can get an idea of what this technique sounds like. TAL Sampler's sample playback is variable samplerate. the diagram on the main page shows how it works. there are varying levels of at-play-time resampler quality, from "hq" to "the most nasty and basic 'sample hold' possible," but it resamples per individual note, as far as i can tell. Last edited by sleepcircle on Thu Jan 17, 2019 4:12 pm, edited 1 time in total. hi thanks. It seems the general opinion is that many software samplers do this at playback. to read a sample, we have PCM format, so like an array of points. Then we scan the array of points to read it. We employ a counter, wherever the counter is at, we read the PCM float value. To make pitch 60, we read at counter speed five, to make pitch 72 we read at ten.